SAFELY, FAST AND COMFORTABLY – TRAVEL TO ZIELENIEC BY SKI BUS! Are you heading to Zieleniec but you do not want or can’t get there by your own means of transport? Perhaps the solution to this problem is Ski Bus – PKS in Kłodzko S.A., which reaches our resort every weekend from 6 January to 25 February 2018 from the capital of Lower Silesia. 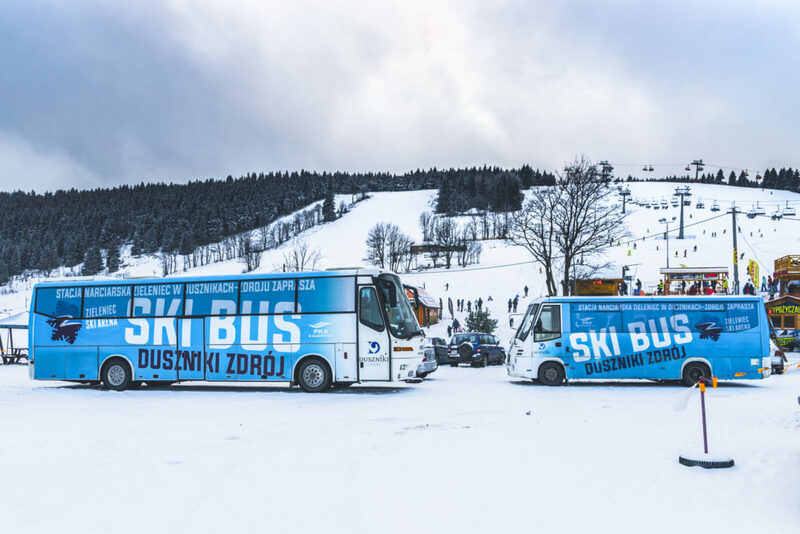 Ski Buses depart every Saturday and Sunday from the station at Sucha Street 1 (Wroclavia Shopping Centre, stand 6) at 6:35, and arrive at 9:03 in Zieleniec. So, almost exactly at the time as the lifts and railways start to work. You can then leave at 16:20 and be back in Wrocław at 18:40. No stress, no rush and early enough to get home for dinner and an evening TV cartoon. Of course, SkiBus stops on the way to Zieleniec in some more important towns: Ząbkowice Śląskie, Kłodzko, Polanica-Zdrój and in the city centre of Dusznik-Zdroju. A ticket from Wrocław to Zieleniec costs PLN 23 (one way) and the same price is offered for a ticket from Zieleniec to Wroclaw. Whereas from Kłodzko to Zieleniec the cost is PLN 9.80. We have some goods news for all those who decide to take this journey using this means of transport-there is a possibility to purchase a 7-day carnet at the ski station (at Gryglówka checkout) with a 15% discount-thus, it will cost you only PLN 76,50. Having a skibus ticket is of course a condition for obtaining a discount. 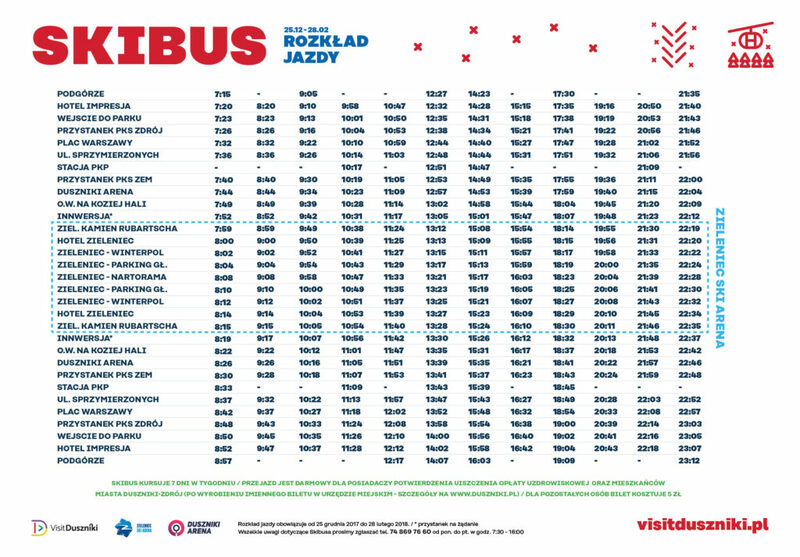 SKIbus tickets Wrocław – Zieleniec – Wrocław may be bought directly from the driver on the day of journey or earlier with a minimum 3-day advance ( 3 working days are required). In order to do so, you should submit your wish to purchase tickets before, writing to the email address rezerwacje@pks-klodzko.pl or calling the number 697,842,777. Once you make the submission you will receive a return information on further steps to be taken in order to realize the purchase of tickets. Payment for the tickets ought to occur via bank transfer to the bank account of PKS in Kłodzko S.A.
Pl. Warszawy – Polonez – Impresja – Podgórze – Muza – Stacja PKP – ZEM i potem już w Zieleńcu – Mieszko – WinterPol – main parking – Nartorama. Stalowy Zdrój – Muza – Podgórze – Impresja – Limba – Sport Hall – main train station. Departure and arrival times have been elaborated in such a way, so as the traveller who arrives to Duszniki can easily make it to the slopes, as well as return regardless of whether they live in Duszniki itself or in Wrocław. The final ride to the station is however scheduled nowadays a lot later than it used to be, as it is at 22:10 (from the stop at Mieszko centre) and to the stop at Sports Hall, arriving at 22:50. And this gives you a possibility of using the Night Rides in Zieleniec! Whilst, the final ride from central train station leaves Zieleniec at 20:26 from the stop at the main parking and arriving to the train station at 21:02. It is worth to add here that the last train to Wrocław is scheduled at 21:06.